Pastisseria Escribà occupies today what used to be the former Casa Figueres named after the family who first established a shop here. Although it is stated that it was founded in 1820, it was originally situated at Sant Ramon street but Jaume Figueres moved into this new establishment in 1842. 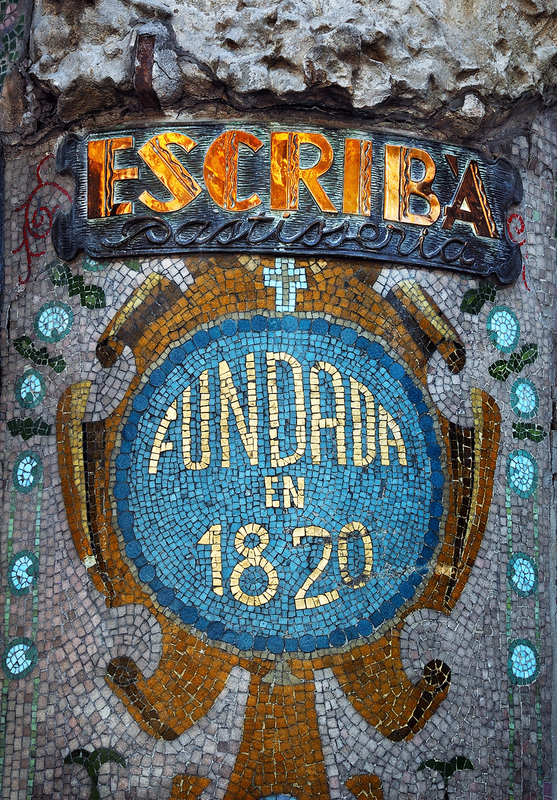 The building was refurbished in 1902 by stage designer Ros i Güell. We should say that the Figueres family used to sell pasta and semolina so this was not always a pastry shop. The building is a beautiful example of Art Nouveau specially because of the rich interior decoration. On the façade the trencadis mosaic prevails along with some ornamental stonework. See it for yourself on this detail located on the corner of La Rambla and Carrer Petxina (petxina is Catalan for shell). The Escribá family bought the house in 1986 and from then on it has become one of the best pastry shops in Barcelona. The exact address is Rambla de les Flors, 83. Escribá also owns another well known pastry shop in Gran Via and a strategically located restaurant in front of the sea where besides the exquisite paella, desserts are a must. Escriba is known as the Mozart of chocolate but that is part of another story. Of course we refer to Antonio Escribà the founder and master. But there is also the son, Christian, a fourth-generation pastry chef or maître-pâtissier who owns the pastry shop in La Rambla at present and has developed an art of his own: patisserie jewels, collections half way between fashion and confectionery. Please read more about these renown artists by following the link above. Check an older post on Escriba Pastry Shop here. Nice! love the mosaic work! Hola Carlos! I love all the mosaic tiles! That was a lot of work - beautiful artistic result! Bravo! Just beautiful, and such an interesting history.